• 19th Century Cotillion Ball with Dodworth Saxhorn Band; Northfield Armory. Saturday, August 3, 8:00 PM- Tickets free to donors who request them. • North Star Cinema Orchestra- Vaudeville Entertainment and Silent Moving Pictures. Sunday, August 4, Grand Entertainment Center, 7:00 P.M. Tickets free to donors who request them. 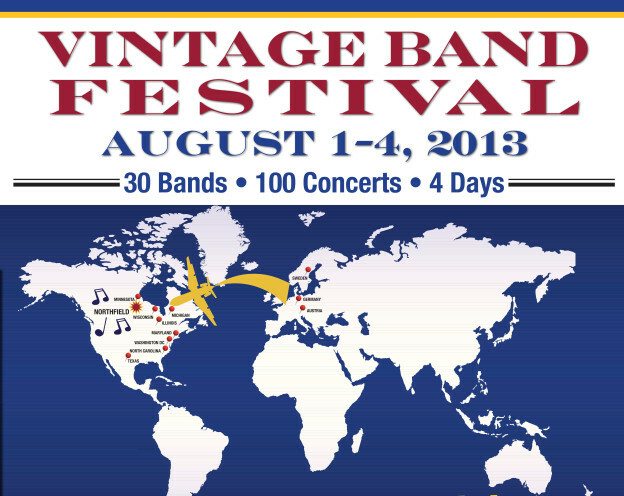 To reserve tickets contact VBF HQ at 507-321-1250 or <vintagebandfestival@gmail.com>. Tickets can also be obtained in person at HQ (CHM 117 St. Olaf College) or at the VBF Booth- Northfield Riverwalk Marketfair on Saturday mornings (we also have shirts, hats, info, etc). This entry was posted in 2013 Press & Ticket info on July 4, 2013 by Paul Niemisto.